Operating without stated terms of service and policy programs can be dangerous, from a legal standpoint. Those extra services are especially useful for those sites that take credit cards, and can go a long way toward keeping your site safe against legal headaches, which as we know, are often the worst kind of headaches. And, even better, one of the folks behind Snapterms is Aaron Kelly, widely regarded as one of the best practitioners of Internet law currently operating today. But all these extra legal protection means very little if you can’t handle the customers you have, so installing some cloud-based telephony features like digital fax and find-me, follow-me systems gives your customer base the best chance to contact you, thus increasing that chances that all this legal protection will be worth it. Legal protection may not be the first thing many people think of when they go to set up their small business, but it’s the kind of thing that should be near the top of the list. 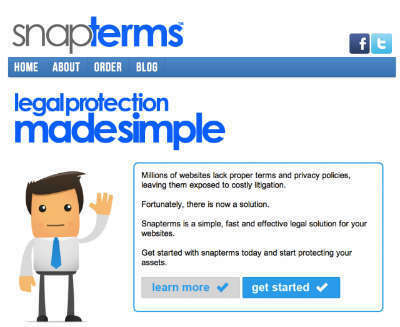 And Snapterms may be just what your small business needs to ensure its own survival in the face of legal threat.